With Bauma looming over the horizon, manufacturers tend to be secretive, saving their product announcements for the biggest trade show in the business. 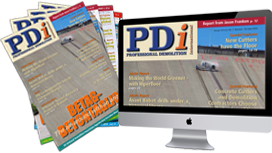 However, PDi managed to gain an insight into some of the developments in the floor sawing industry. Andrei Bushmarin reports. The new Multicut 800 floor saw from Germany-based Lissmac features a hydraulic extension unit that provides a wide wheelbase and machine stability. This solution allows operators to use blades of larger diameters, which was previously problematic. The hydrostatic gearbox ensures precise feeding while the feed lever can be changed for clockwise or counter clockwise cuts. Powered by a 44kW water-cooled four-cylinder Kubota turbo diesel engine, the machine operates in two speed modes of 1,550revs/min and 950revs.min. When equipped with a 800mm saw blade, the Multicut 800 achieves a cutting depth of 315mm. However, with the aid of optional tools the new floor saw has a cutting depth of up to 515mm. The Multicut 800 is controlled by a manually operated steering wheel mounted on the front of the saw. It comes in two versions, the basic Multicut 800 G with the gearbox, and one with a hydraulic suction interface designated Multicut 800 GH. The gearbox has clockwise, counter clockwise and neutral settings. Rapid V-belt exchange makes possible the changeover to a second rotation speed. Optional shaft speed kits of 2,500/1,550revs/min, different size saw blade guards, with or without suction mechanisms, along with other accessories, are available for this model. 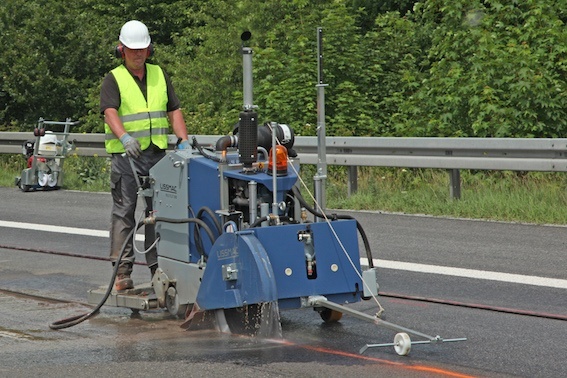 The rookie French player in the international market, Sept Tools, continues to carve a niche for itself with a range of environmentally friendly machines powered by brushless motors. The most recent addition is a walk-behind crack chaser called Taupe (a mole in English). It comes equipped with a 230V single-phase motor with the rotation speed varying from 2,800revs/min to 4,800revs/min. Due to the brushless technology, the motor is extremely durable and requires almost no maintenance. Weighing 7kg, the chaser is primarily intended for indoor applications and can be easily transported to sites in a small car. Accommodating blades of up to 200mm in diameter, it has a maximum cutting depth of 38mm. Thanks to an integrated suction system, the Taupe boasts class protection IP64, which guarantees dust-free operation. Another entrant to the European concrete sawing and drilling industry the Finnish company Dus is about to enter the market with its budget walk-behind floor saw. According to the manufacturer, the Dus FS 270 floor saw offers the same performance and reliability than rivalling European brands, but is 1.5 to 2 times cheaper. Powered by a 7.5kW motor, the machine accommodates 700mm and 800mm diameter blades and has a maximum cutting depth of 270mm and 320mm respectively. Featuring a module construction, it can be dismantled in three parts, each weighing less than 40kg, in about 5min. The blade guard, which consists of two parts, can be mounted on either side of the machine.